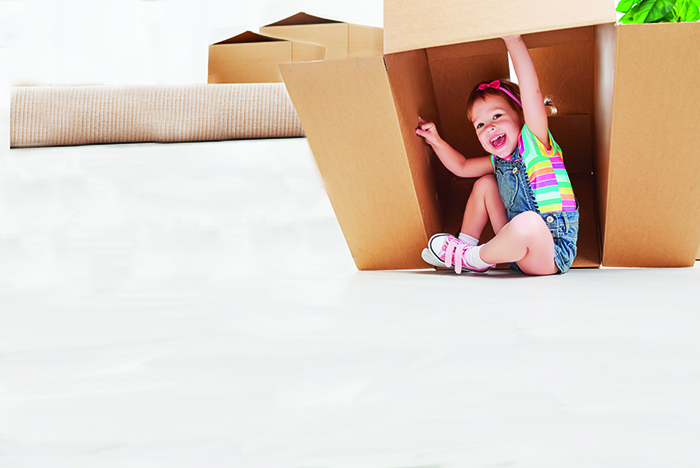 Children can either love or hate the idea of moving to a new house. To minimise any disruption and upset, it’s a good idea to show them their new home and its surroundings before the big day. Try to spend some time there and show them the local parks and places they will be able to visit once they make the move. Allow them to see their new rooms and to plan out where all their things will go. Get them involved in the process of packing up their old rooms as much as possible. Personalising any boxes they have packed, with colouring pencils and stickers, is another helpful tool. Whether you are using a removal company or hiring your own van, pack up your children’s toy box last. This will mean that on arrival they will be the first things taken off the van and can be a good distraction, allowing them to unpack their own things, in their own rooms which may allow you a few minutes to unload and organise where the other boxes are going! It might also be a good idea to keep them in one room whilst larger furniture is being moved in, as this will prevent removal men or yourselves from stepping on toys scattered on the floor. Making up survival kits for the move is a useful idea when moving with children. You should include such essentials as nappies, snacks, a change of clothes and their favourite toys or books, this will hopefully keep them distracted while the bulk of the moving is done. It might also be a good idea to make your own survival kit, with bottles of water, a check list and energy boosting snacks. Let’s be honest, leaving the kids with a relative or a friend would reduce the stress levels, allowing you to organise the bulk of the work without the added pressure of entertaining bored children. However, this is not always possible, so if you must look after them on moving day, explain what is going to be happening on the day and, if necessary, promise to reward them for helping. Give them roles and specific jobs to do; such as being the toy monitor. This will put them in charge of making sure all toys and cuddly bears are packed away and nothing is left behind. Make the first night in your new home special. Instead of unpacking all the boxes as soon as you move in, order a pizza and put on their favourite film. Spending time as a family and making memories in your new home will help settle them for their first night. You could always have a camp-out in the living room, with a pillow fort and lots of snacks! If you are moving a long distance away, it might be a good idea before the move to create a memory scrapbook. This can be done as a family, including pictures of the old house and garden, memories had there and pictures or even messages from family and friends. The scrapbook could be personalised by your children and can be given to them to keep safe. This will create lasting memories they can take with them to the new house. Organising a small leaving party is also a good way to create positivity surrounding the move and is a great way to say goodbye to everyone. Take lots of pictures and ask everyone to write messages in your scrapbook. It might be a good idea to unpack and sort out your children’s rooms first, or as soon as possible. This will mean they have familiar things around them and will help them to settle into their new rooms better. Unpacking their toys, teddies and books will also keep them distracted whilst the rest of the boxes are unpacked. In the days that follow the move, explore the new area by visiting the nearest parks and local shops. Getting to know your new surroundings will help to normalise the area. You might even find local baby or toddler groups, a great way to meet new friends for both you and your children and it’s also the perfect way to find out everything there is to know about the area. Finally, children will notice if you are negative or stressed about the move and will often mirror these feelings. Moving to a new house can be a fun and exciting time, so make sure you inject that into the process of moving.